The rate of police-reported crime in Canada dropped 6% in 2011, and is now at its lowest level since 1972, says the national statistics agency. Excluding traffic offences, 1,984,916 incidents were reported last year , marking the eighth consecutive annual national decline in crime. Less property crime, fewer break-ins and car thefts drove the crime rate down, but there were more murders. Crime peaked in 1991 in Canada but has seen a downward trend since then. The figures, compiled by the Canadian Centre of Justice Statistics and released by Statistics Canada on Tuesday, showed that the 7% increase in homicides to 598 was a result of more killings in Alberta and Quebec. But the report said that "despite annual fluctuations, the homicide rate has generally been declining since peaking in the mid-1970s". But the crime severity index, which measures the seriousness of the crime, was down by 6% last year. 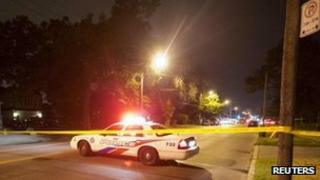 For a number of years violent crimes have made up about 20% of all violations reported by police, CBC News reported . The annual report noted that while four out of five adults charged for crimes in Canada were male, the number of female offenders has been rising in recent years. Women accounted for 49% of abduction cases, 47% of prostitution cases, and 37% of thefts under CAN$5,000 (£3,157). Recent figures from the FBI suggests that crime rates are also declining in the US. A 2011 report suggested that in 2010 violent crime had dropped by 6% from the year before - a fourth consecutive annual decline. Property offences were reported to be down by 2.7% from the previous year in the US, data from nationwide law enforcement agencies showed.